I’m experiencing an absence of blogging ideas today, so I decided to write about another absence that has showed up in my life recently — new TV episodes to watch. Every show I like is now 1) cancelled or 2) on hiatus. Agents of S.H.I.E.L.D is on hiatus, too, but there are episodes I haven’t watched yet and I still haven’t decided if I like that show or not. It’s been renewed, though, so I’ll have a second season to make up my mind, if need be. This lack of new episodes isn’t all bad, though — I’ve read a mountain of books. The latest 5 are were Rebecca by Daphne Du Maurier, Enchantment by Orson Scott Card, Chalice by Robin McKinley, The House At Riverton by Kate Morton, and Shadows by Robin McKinley. I’m currently re-reading The Hobbit, and I picked up four more at the library on Friday, all young adult novels. I’m calling it “researching the target audience” for my novels. If you’re a Whovian, you already know what I’m talking about from my title. If you’re not a Whovian, you are probably going to stop reading right about here, but I’ll explain anyway. Doctor Who is a British sci-fi series celebrating it’s 50th Anniversary this year. The main character is an alien and he can “regenerate” instead of dying, hence taking care of the problem of recasting an actor. The 11th Doctor, Matt Smith, will be leaving in the Christmas special this year. First off, I’ve seen some terrible arguments in favor of the Doctor remaining male. And they’re giving the rest of us a bad name. No. No. No. No. No. No. No. No. No. No. No. No. No. No. No. No. No. No. No. Oh and by the way. No. (This is an exact quote. I didn’t add a single “no” myself.) This just makes it sound like you don’t have a rational argument. Probably because you don’t. Haven’t seen this one myself, but I heard someone griping about it on a podcast. How can you expect to be taken seriously when you’re only argument is a grossly outdated “men are doctors, women are nurses” idea? Actually, I like this argument, but I admit it has flaws. 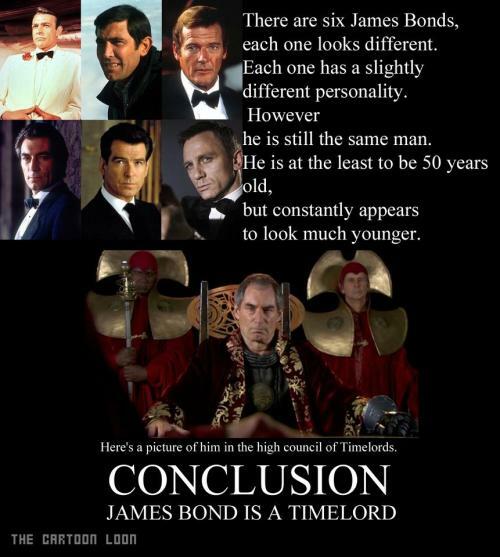 For one thing, you can argue against it pretty easily by saying Bond isn’t an alien. Although some people think he’s a Time Lord, the roles really are different enough to make this one of the weaker arguments. Okay, on to the “serious” arguments against turning The Doctor from a Time Lord into a Time Lady. I’ve only watched new Who (since 2005, as opposed to classic Who from 1963-1989), but I’ve read enough to say the following with almost 100% certainty: there are Time Lords, and there are Time Ladies. They are as different as male and female humans. As far as I know, the only time we know of a Time Lord regenerating as a female is The Corsair, as mentioned in “The Doctor’s Wife.” Yes, it can happen according to cannon. No, it’s not normal or likely. Gender isn’t nearly as fluid as some people like to think. And all indications are that The Doctor sees himself as a man (1:36-1:40 in this video he is seriously freaked-out that he might have regenerated as a girl), which would make a gender change as problematic for him as it is for the audience. Doctor Who is an established show with an established character. The Doctor changes personality a little when he changes faces, but some things remain consistent, including the fact that he is a madman in a blue box who travels with a female companion. Shaking that up too much risks estranging the fan base and sending Doctor Who on another 16 year (or, horror of horrors, a permanent) hiatus. While I don’t trust Steven Moffat not to cast a female Doctor so he can go down in Who history, I don’t think the BBC will let him do that. This is my personal favorite. When asked about the possibility of casting a woman as The Doctor, this is what Alex Kingston said (she plays River, who’s married to the Doctor). I think there are plenty of fan-girls who would agree. To be honest, I don’t really care who they cast as the next Doctor as long as it’s truly in keeping with the character. And that means it has to be a man. Ethnicity and age don’t even matter, so long as he’s talented enough to develop his own take on the classic character. I don’t have a specific actor in mind, mostly because the actors I’m familiar enough with to know they’d be a good Doctor probably wouldn’t commit to the 9 months of filming required by Doctor Who. It doesn’t have to be someone we recognize — Matt Smith was relatively unknown when he was cast, and turned out to be a great Doctor. I’d prefer if the new actor was British, but I suppose even that’s negotiable.